The Wits Microbrewery team won Best Irish Beer at the WortHog Summer Beer Festival in Pretoria a week ago. The festival comprised of 40 home brewers and the Wits team of eight was the only university there. The team brewed their way to first place when they entered their Irish red ale. The team of eight is made up of Nicholas Burman, Idris Sadik, Tamlyn Sasha Naidu, Sean Rossouw, Chia-yu Chen, Victor Dippenaar, Paul Gordon and Mluleki Msomi. Third-year PhD Chemical Engineering student, Burman, who led the team to victory, told Wits Vuvuzela that the judging of the brew was based on, but not limited to, appearance, aroma, alcohol content, as well as flavour. “The beer was red in colour, malty, had a bready/ toffee/ caramel flavour to it. It had a dry finish, medium to low bitterness, low alcohol level of 4.5% and was very refreshing,” Burman said. First-year MSc Chemical Engineering student, Sadik, said that they were ecstatic about the win, but also surprised, as they did not expect to win. “We weren’t too certain that it was a pretty good beer, but people at the festival enjoyed it,” he said. Sadik added that it was great to win and that they celebrated with a couple more beers after receiving a prize of 12 various local craft beers and an electronic temperature controller. 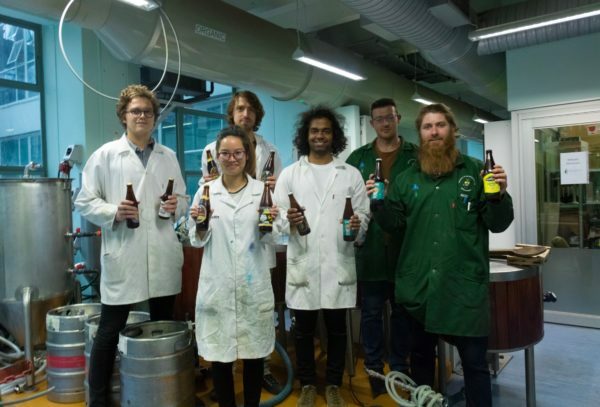 Fourth-year BAccSci student, Subramoney, said the beer did not taste bitter, which is a drawback he experiences with beer. “It’s a good balance for what you want in a beer for both beginners and seasoned drinkers. That’s why they won. They should make a professional brand, take this further,” said Subramoney. Burman and Sadik have described the festival as fun, a good opportunity to learn more about brewing and a good opportunity to get feedback. The team will participate in the annual SAB Intervarsity Beer Brewing Champions taking place in September, which they won for the first time last year.